Cash-strapped Kumho Asiana has agreed to sell its flagship airline subsidiary to raise badly needed capital. 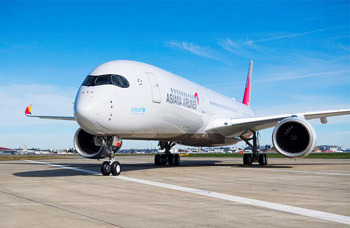 Main creditor Korea Development Bank on Sunday said it held marathon negotiations with Kumho Asiana over the weekend and pledged a bailout in return for the conglomerate handing over its stake in Asiana Airlines. "We don't have much time left to decide," a financial regulatory source said. "Kumho will soon unveil its plans for Asiana Airlines and take steps to gain approval from the board." That will reduce Kumho to a mid-sized conglomerate with only Kumho Tire, Kumho Buslines and builder Kumho Industrial under its wing since Asiana accounts for some 60 percent of the group's revenues. Earlier, Kumho asked creditors for a W500 billion bailout by offering as collateral the shares in the conglomerate's de facto holding company held by chairman Park Sam-koo's wife and daughter, while Park pledged not to return to management. But instead his son was mooted to take over and turn things around within three years, and both creditors and the Financial Supervisory Service rejected the plan as not credible. The selloff will probably allow Asiana to avoid a debt repayment deadline at the end of this month. Asiana owes more than W1 trillion, which would have to be honored immediately if its credit rating was downgraded (US$1=W1,138). But a source at a creditor bank said, "There is still a long way to go to conclude the deal" and get the group back on its feet.